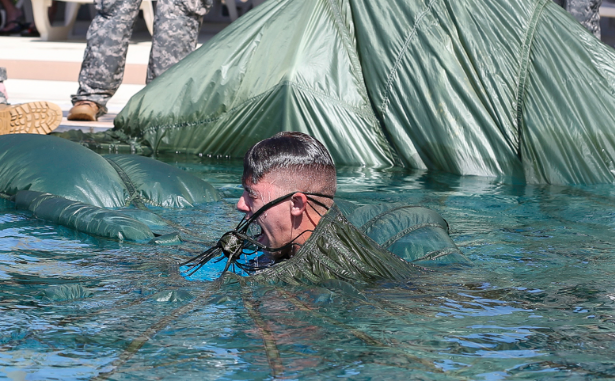 A member of 1/1st Special Forces Group swims out from underneath his parachute canopy in a pool as part of water jump training. (photo Richard Rzepka - USAG Okinawa). Special Operations News Update for 20161127 – Recent news reports from around the world about special operations forces. AFSOC training areas increase, book review Deadly Deception, SEALs winning elected office, a SEAL leaves service to play Big Ten college football as a fullback, book review of WOLF’s Inferno, and more. AFSOC Expands Training Areas. The special operations wings at Kirtland Air Force Base has received the approval to train at a small airfield in New Mexico. The rural airport will allow “lights out” training without the distraction of ambient light. (AFSOC, Nov 1, 2016). Book Review Deadly Deception. Dr. Eric Redmon has wrote a novel about a Special Forces Soldier who balances his military life with his family life as he runs around the world chasing bad guys. Read a review of the book (The Winchester Star, Nov 18, 2016). GBF Honors Man from Westport, CT. The Green Beret Foundation honored David McCormick with the Quiet Professional Award at a recent New York City event. (Westport Now, Nov 17, 2016). Book Review of Wolf’s Inferno. This book is the third in a series about a former Navy SEAL (Tom Wolf) and retired Green Beret (Sam McFadden). A Manila assassin team from their past tracks them to San Diego and teams up with a local Asian gang in an effort to kill them. (Rosemont Town Pages, Nov 18, 2016). SEALs Win Elections. Four U.S. Navy SEALs are now serving in elected office. One as governor of Missouri and three others in the U.S. House of Representatives. Read “Former Navy SEALs find beachhead in public office, expect reinforcements”, The Washington Times, November 16, 2016. SEAL Now Playing Football for Big Ten. Tom Hruby, a NAVY SEAL, has left active duty for a new job. He is a student at Northwestern and walked on the football team to play the position of fullback. Read more in a news story in Military Times, November 17, 2016. SOWF Fundraiser. The Special Operations Warrior Foundation (SOWF) – a nonprofit organization – recently held a fundraiser to benefit the children of fallen special operators. The SOWF provides full financial assistance for post-secondary degrees from accredited two- or four-year colleges, universities, or technical / trade schools. Read more in “Event pays tribute to special ops forces”, NWF Daily News, November 17, 2016.